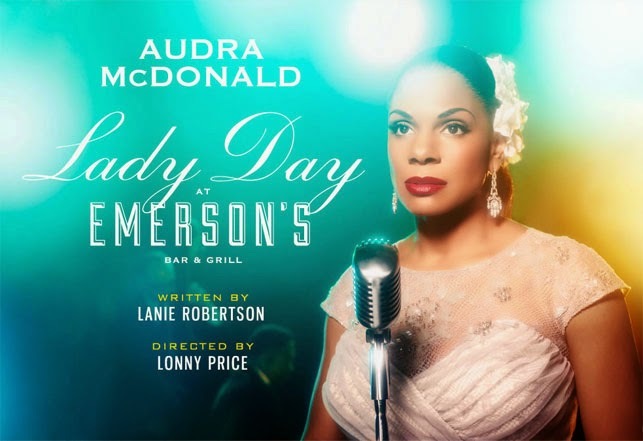 There’s not much time left for you to spend the evening with Billie Holiday as personified by the remarkable Audra McDonald in the tightly written play, Lady Day at Emerson’s Bar & Grill, by Lanie Robertson. The production at the Circle in the Square Theatre is well directed by Lonny Price and lit by Robert Wierzel with a clean, full sound design by Steve Canyon Kennedy, and a marvelous costume for Ms. McDonald by Esosa. The musicians are thrilling: pianist Shelton Becton playing “Jimmy,” bassist George Farmer and percussionist Clayton Craddock. The evening’s music coordinated by Michael Keller is a mix of standards that sound non-standard in Billie’s signature style. Just as Billie Holiday’s audience would have demanded and waited for those certain songs she must always sing, so a theatre audience behaves more like a club audience, encouraged by the set consisting of an oval lounge space designed by James Noone with café tables & chairs, and a small stage elevated barely a step on one end for the piano, bass player, and drum set. A standing microphone, a small table, and a tall stool await Billie. This 1950s dive is surrounded by a rail setting it off from the rest of the auditorium that rises in a sharp incline from the three quarter stage, so the view for all is spectacular and intimate. Billie enters from a tunnel opposite her performance platform when the pianist, Jimmy, introduces her. In this instance, the applause for a performer just because she appears was neither misplaced nor annoying: Ms. McDonald accepted the applause as Billie, graciously acknowledging the audience that loves her because, as she states repeatedly, they’re her friends. 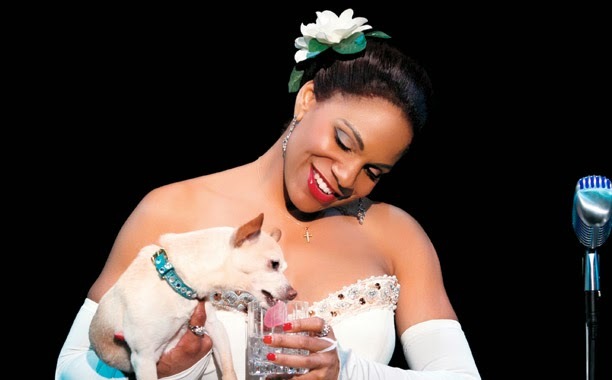 Audra McDonald has a glorious voice, but we don’t hear the real thing. She has subsumed her voice into her impersonation of Billie so that we hear Billie. We see Billie. I expected this to be good, but was overwhelmed by the simple story of one evening near the end of a complex life. Good writing — not to mention Ms. McDonald’s brilliant delivery — induced me to have warm feelings for some of Billie's long-gone friends and relations, and a distinct dislike of her first husband, Sonny. “Lady Day” would step down from her elevated stage and walk among the tables, chatting, touching, mooching a cigarette, a drink. Each time up or down that single step to and from the stage is more difficult than the last. Lady Day disintegrates before us and our hearts ache for this lonely, broken, disappointed woman. It’s a poignant and powerful evening, in which Ms. McDonald’s rendition of “Strange Fruit” was pure Billie and more. It shook us to our roots as her deep tones shook the rafters. And let us not forget Lady Day’s dog, Pepe, beautifully played by Roxie, a rescue dog trained by William Berloni. The play includes one moment that continues to live with me, near the end, when Billie leaves the stage unexpectedly to go back to her dressing room. Her face, stunned, hazily driven, just freezes the blood, and then she returns with that evening glove rolled down…. The gentle diligence with which “Jimmy” rolls her long glove back up her arm is heartbreaking. Well done Messrs. Price and Robertson. If anyone wonders why Ms. McDonald won a record sixth Tony for this performance, there’s only one way to know for sure. Get your tickets for a 90-minute performance at the Circle in the Square Theatre before this limited engagement ends on September 21st. ~ Molly Matera, signing off to listen to Billie sing….